Walt Whitman wrote in the preface to the 1855 edition of Leaves of Grass, “The proof of a poet is that his country absorbs him as affectionately as he has absorbed it.” This theme manifests throughout the work of Deborah Martin, a contemporary realist landscape painter who conveys the essence inherent within marginalized communities that exist on the fringes of American society. During much of his career, Whitman worked as a reporter. This experience proved formative to his development as a poet. Comprised of detached observations, rich with crisp imagery, Whitman’s poetry embraced a new style of writing that depicted modern America, marked by man’s imprint. Martin’s newest series, The Slabs: The Last Free Place in America, gives voice to the nomadic cultures that drift in and out of Slab City. Located within the Sonoran Desert, Slab City consists of nothing but the concrete foundations that once braced the barracks of Camp Dunlap, a World War II training facility. After the war, the facility’s operations ceased and the camp’s buildings were removed. By 1961, the camp was completely deactivated; since then, Slab City has attracted tens of thousands of campers who flock to its ruins during the winter months, before the heat of the summer sets in. Despite the desert’s high temperatures that can reach 120 degrees during July, August, and even September, approximately 150 residents live in Slab City year-round. While many are too poor to live elsewhere, several embrace the idea of living off the grid. Because the area is uncontrolled, anyone can park within the City’s limits, free of charge, since Slab City does not offer even the most basic of amenities such as electricity, running water, sewage disposal, or trash collection. While the inhabitants of Slab City are noticeably absent from Martin’s work, her paintings radiate with an underling pulse emblematic of the community’s soul. Such is achieved through the artist’s ongoing investigation of contrasting themes that touch upon isolation as well as community. A constant that runs throughout Martin’s work is the notion of home and what such means to those who live an itinerant existence. “The Slabs” (2014), for example, depicts a medley of chairs, battered and broken, atop one of the City’s cement foundations. The discarded furniture, seemingly abandoned and situated beneath the blaze of an unforgiving sun, is arranged in a circle, suggesting that the space is in fact used as a point of congregation. 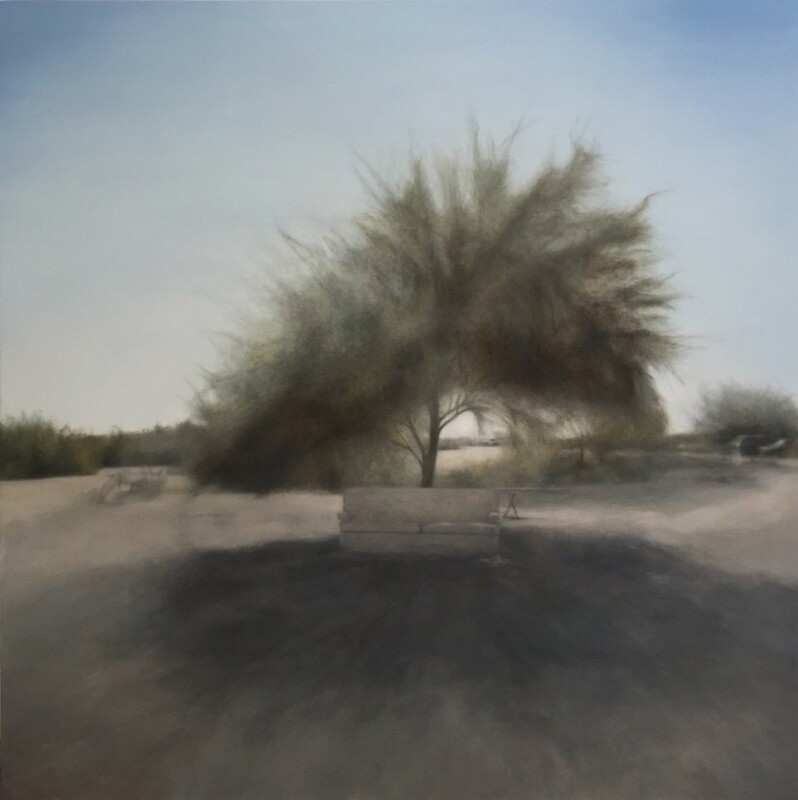 The Slabs is not Martin’s only body of work to feature marginally inhabited desert landscapes. Home on the Strange: In Search of the Salton Sea documents a distinct desert community. Like Slab City, the Salton Sea has a history that runs contrary to its current day appearance. The result of a 1905 engineering enterprise gone awry, the Sea arose from an unplanned overflow diverted from the Colorado River. For four years, Martin immersed herself within Salton Sea’s eclectic community that occupies what Christopher Busa describes as a “man-mauled, unidealized landscape.” Snapping hundreds of photographs, she documented most every aspect of the area, and, in doing so, was able to source select imagery to base Home on the Strange, a body of work that collectively articulates a way of life with which few are familiar. Included in this series is “Love” (2009), a painting that features the trailer of Leonard Knight, Salvation Mountain’s late creator. Rendered alongside salvaged debris accumulated in the outlying desert is Knight’s desert home onto which the word LOVE appears in big block letters. While Martin’s painting of Knight’s trailer reflects his reclusive lifestyle, it also embodies Knight’s heartfelt desire: to spread God’s message of love by building a massive cavernous structure from desert detritus, which he supplemented with adobe and acrylic paint. Back of Beyond is another series by Martin. It features scenes of the unincorporated town Wonder Valley, located in Southern California’s Mojave Desert. The imprint of America is more than apparent in this group of landscapes that feature large, gas guzzling vehicles from the 1970’s and 80’s. Bleached bare from years of unprotected exposure underneath the sun’s aggressive blaze, Martin’s vintage sedans, vans, and convertibles don’t only evoke an air of abandonment, but they chronicle that which has been forgotten in exchange for what our commercially driven society considers worthy. Though the bulk of Martin’s work focuses on desert life, her origins are rooted in the East. Born in Boston, Martin grew up outside Philadelphia and recollects her time spent at her grandfather’s cottage on Cape Cod as the “fondest memories of childhood.” In Narrow Lands, Martin chose to explore the historically rich neighborhood of Provincetown, which she remembers from her youth and is currently at war with gentrification. While some of the houses in the area have been restored to their former grandeur, others remain boarded up and blistered from neglect. Martin’s paintings that feature structures on the Outer Cape have justly warranted comparisons to Edward Hopper’s. Like Hopper’s paintings, Martin’s interpretations provide neither a critical nor celebratory stance. Rather, they evoke “an emotional complexity nearly operatic in scope: with the silent, vacant architecture, human drama seems to exist more powerfully in allusion,” as offered by Quintan Ana Wikswo. Unlike Hopper, however, Martin’s application of paint is undetectable. Her technique relies upon the strokes of a micro-sized brush measuring just 1/32 of an inch in width. Over the course of a single painting, Martin can go through as many as twelve brushes. With exception to the blue sky-scapes that dominate most of her canvases, she favors a Size 0 brush because it allows her to push her paint in such a way that makes for a realistic portrayal of her subject matter, which she illuminates by a slightly blurred glow that is as subtle as it striking. The Slabs: The Last Free Place in America will remain on view through July 11 at George Billis Gallery, located at 2718 South La Cienega Boulevard, Los Angeles, California.